Frank Lloyd Wright was born in 1867 and was a controversial character who some say never constructed a building that was watertight and always argued with his clients. He had a definite aesthetic and knew how a building was supposed to look, including how each room should be furnished once the commissioned building was complete. Hiring Wright to construct a home was agreeing to live by his vision – no exceptions. 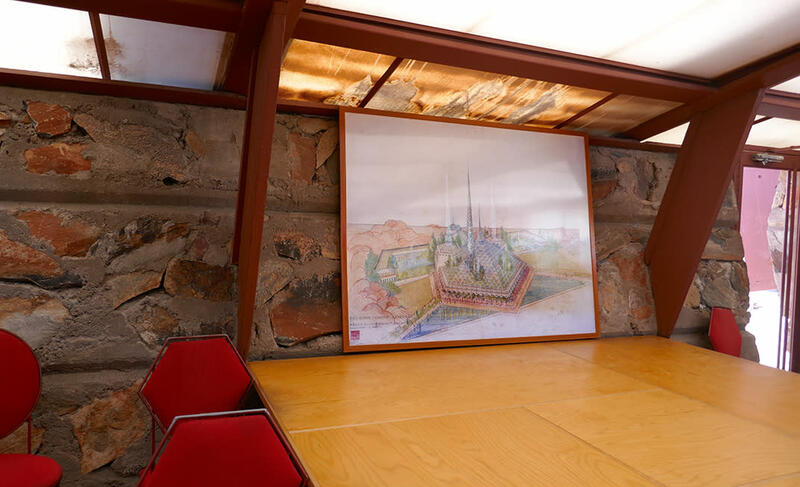 Wright’s legacy lives on today in Scottsdale at Taliesin West ,which served not only as the architect’s winter home, but also was where his apprentices worked and lived. Starting in 1937, Wright and his last wife, Olgivanna, made the annual trek to Scottsdale. During the first years, the Wrights essentially camped out in the desert. 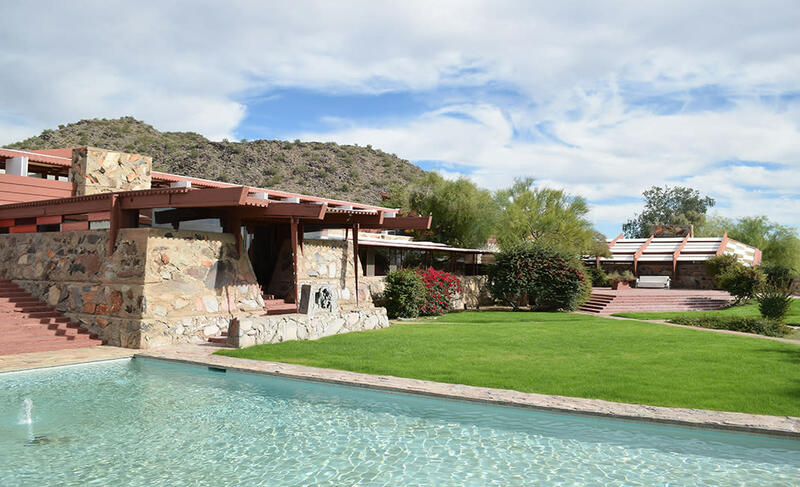 As Taliesin West evolved, Wright’s School of Architecture grew and prospered. Today, you can take one of many tours to explore the legacy and the legend that is Scottsdale’s only National Historic Landmark. The 90-minute Insights Tour is offered daily and explores the Wrights’ private quarters, the drafting studio and the impressive Music Pavilion. With each stop on the tour, your guide will share stories of the property. For a more in-depth exploration, I recommend either the 3-hour Behind the Scenes Tour or the 2-hour Details Tour. I took the Details Tour recently and was fascinated that I discovered things I’ve not noticed on my previous visits. Depending on the guide, you’ll hear different stories. On the afternoon I visited, our guide even played Wright’s piano. While many of the furnishings are reproductions, the piano is an original, so moments such as this are treasures. Looking out over the gardens, it’s easy to imagine what it must have been like on a winter’s evening in the early 1940s, with no power lines, no housing developments, no sounds of airliners overhead. The only sounds would have likely been a coyote howling in the distance or a hawk calling from the nearby McDowell Mountains. It is not hard to imagine why Wright lost his heart to the Sonoran Desert and why he wanted to keep his designs simple to welcome in the breathtaking natural setting. As you explore Scottsdale, you will see other reminders of Wright. One of the most visible is at the intersection of Scottsdale Road and Frank Lloyd Wright Boulevard. The Frank Lloyd Wright Spire is a 75,000-pound, 125-foot-tall spire built in 2004 to honor a design Wright offered in 1957 for the Arizona Capitol building. His design, dubbed “The Oasis,” was a futuristic spire and glass canopy that stymied the state legislators at the time. At night, the Spire lights up in blue and green and can be spotted for miles. Other Wright influences include Gammage Auditorium on the Arizona State University campus in nearby Tempe. Wright had originally planned a similar design for an opera house in Baghdad, Iraq but that structure was never built. Gammage Auditorium opened in 1964 and to attend a performance there is to witness the genius of Wright’s concepts for public spaces. As you walk up the winding paths to the upper seats, you’ll notice Wright’s indoor/outdoor design aesthetic. Best of all, even the highest seats have wonderful acoustics. Building tours of Gammage are available. Not only can you see Wright’s buildings, but as you explore Scottsdale, it becomes obvious that his influence was on the minds of other architects who designed our hotels, office spaces and public buildings. One of Wright’s most famous students, the late Paolo Soleri, created his Cosanti studio in the residential neighborhood of nearby Paradise Valley. Soleri’s studio, workshop and his creative bronze bells are a testament to Soleri’s creativity and a nod to his early mentor. Over his lifetime, Frank Lloyd Wright designed more than 1,100 architectural works, 532 of which were constructed. 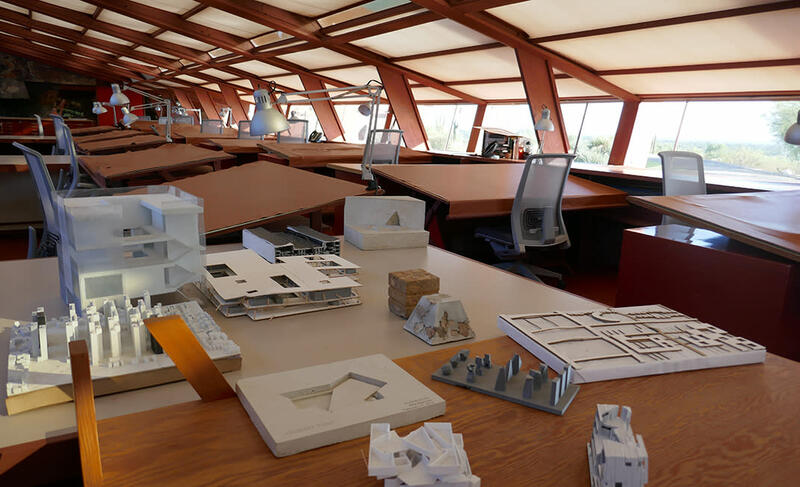 The School of Architecture at Taliesin West remains a vital part of today’s architectural scene, completing projects not only here in Scottsdale, but around the world.